Number 4, Elixer Restore & Repair Oil - Faint perfumed scented oil to add shine to the dry ends of our hair. Coola, SPF 30 Organic Makeup Setting Spray - One last spray for added SPF protection, hydration, and makeup setting glory. treStiQue, Color & Smudge Shadow Crayon - Aspen Pine color - Shadow and liner in one! Overall, this is a good BirchBox! If you are interested in signing up to get your own, our money saving tips are linked here. Thanks for reading! Find us on Facebook at Glambo. Follow us on Instagram and Twitter @GlamboGirls if you are on those platforms. We generally follow back. 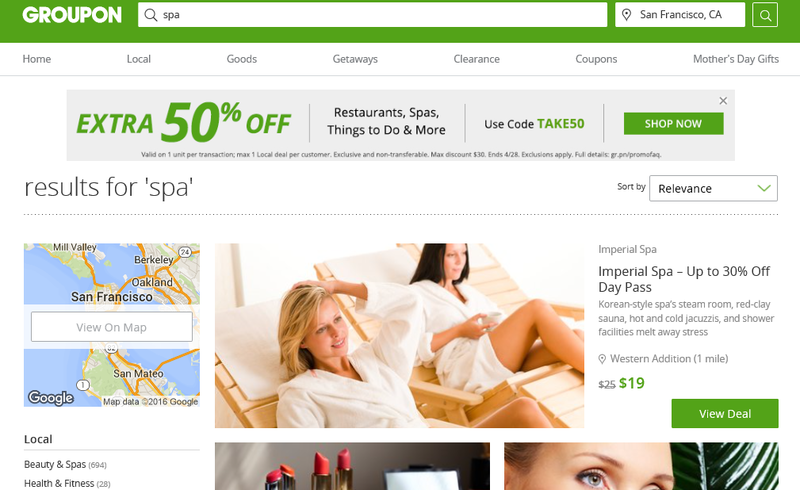 We normally review full-size products here on Glambo because we like to use the product many times with it's original dispenser. We tried theBalm Stainiac in the Beauty Queen shade via sample sizes received from our March 2016 BirchBox. The results are neutral. 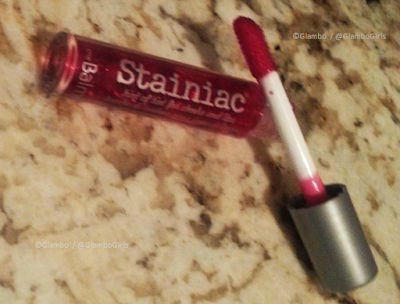 Overall, Stainiac cheek and lip stain is good. We like the dual purpose. It leaves a hint of color as both a blush and lip shade. Don't be intimidated by the color in the bottle. It goes on lighter and sheerer than it appears in the container. It looks redder or pinker depending upon the lighting. Personally, Stainiac isn't a product we are likely to buy again. I'm not sure we are lip and cheek stain people. You can layer the lip color to get a darker hue. However, it reminds us of a long wearing lipstick that has been worn for several hours. The lip stain is slightly drying in nature. The faint color and dryness make us want to apply a moisturizing lipstick over it. We're not a fan of applying anything drying to the cheek area. The 'hint' of color isn't worth it. Maybe we just don't completely understand the stain concept because it seems easy to apply blush and lipstick. 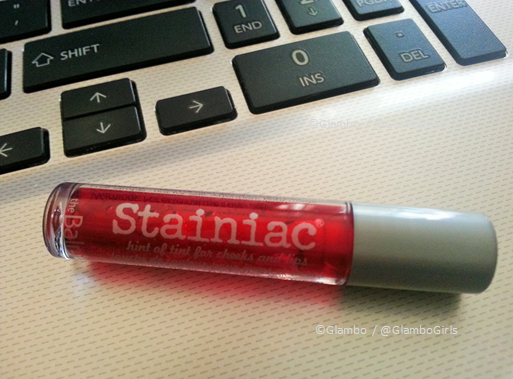 Again, the dual purpose of Stainiac is nice, but we're not sold. We would purchase two products we already like to do the job better. The great part of receiving a smaller size of theBalm Stainiac is that it's perfect for the travel bag or desk drawer cosmetics bag. It will be used again, but not likely in it's entirety. 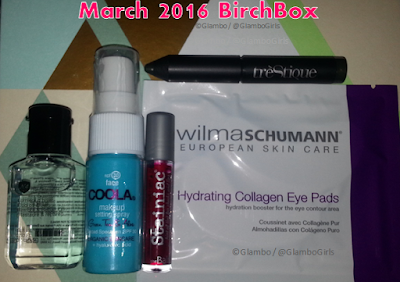 See the other contents of our March 2016 BirchBox here. 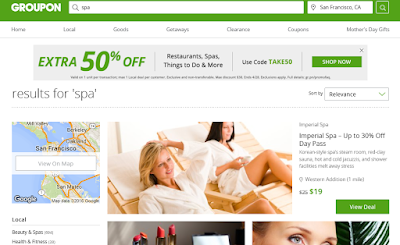 hey honey, Take it Off - This was the item we picked for the month. The hey honey brand is new to us, but the peel-off mask sounds like retro beauty fun! Pop Beauty, lipstix - Full size lipstick in Satin Rose shade and 'matte velvet' finish. Klorane, Dry Shampoo - We are dry shampoo fans, and were happy to see a new brand in our BirchBox. However, this product leaves more white residue than any we have tried. FYI. Juara, Candlenut Body Crème - A silky smooth lotion with a light floral fragrance. Revive, Cooling Cheek Tint - Our first cheek stain. The color compliments the Pop Beauty lipstick included in this month's BirchBox. 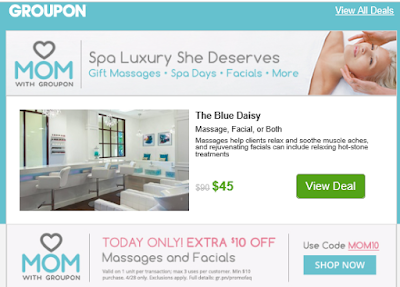 We discovered last month that you can earn points for completing BirchBox reviews. They currently equal $1 per review for a total of up to $5 per month to spend in the BirchBox store. Yay! Discounted make-up. Woo-whoo! 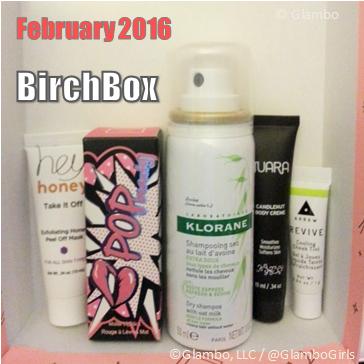 Stay tuned for more beauty reviews and next month's BirchBox reveal.